Relating to being unloving or unfeeling. Descriptive of that which cannot be shared, told, or transmitted: "Samuel possessed the incommunicable information about the decisions made by the Board of Directors." 1. Unsuitable for comparison or lacking features that can be compared. 2. So excellent, outstanding, or unique as to have no equal. 3. Impossible to compare with something else, because there is no basis for a comparison. 1. Not concealable or something which can not be hidden. 2. Anything which is not hidden or that is unable to be kept as a secret. 1. Something that is impossible to think about or to imagine: Brandon's inconceivable success in business was thought to be highly unlikely. 2. Descriptive of something which is so unlikely that it is difficult to believe that it exists: The earthquake was an inconceivable disaster that was impossible to image. There are some inconceivable things that really can't happen or certainly will not happen. Impossible to understand: It was inconceivable that the professor wrote such an unsubstantiated article about the president of the university. 1. Impossible to be understood by the mind or contrary to reasonable expectations: It was unthinkable that the children should be expected to walk so far. 2. Difficult to imagine or to believe: It was unthinkable that the teacher was leaving the school before the end of the semester. Tamika found the mathematical formula on the examination inconceivable; however, it was unthinkable that she would fail the exam because of this one problem. 1. 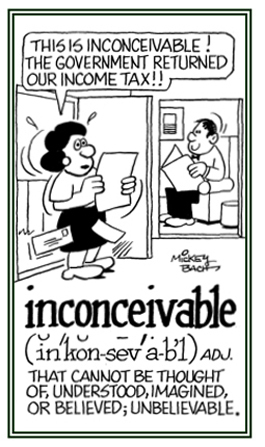 Difficult or impossible to condense: "The judge presented an incondensable judicial opinion." 2. 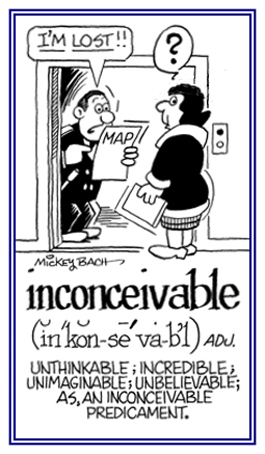 Not condensable; incapable of being made more dense or compact, or reduced to liquid form. Extremely sad and very disturbed and unable to be comforted: Mildred was most inconsolable when she heard that her brother and his wife died in the airplane crash the day before. A reference to anything which can not be burned. 2. Not subject to blame; blameless. Showing page 19 out of 43 pages of 633 main-word entries or main-word-entry groups.